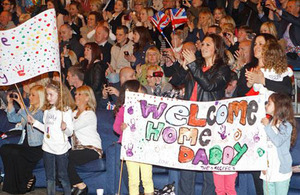 Gunners from 2 Squadron RAF Regiment returned home last week from a six-month Afghanistan deployment to an emotional reunion with friends and family. The gunners, who are the RAF’s ground-fighting force, were stationed at Camp Bastion in Helmand province, the UK forces’ main base in Afghanistan, and provided it with protection from attack. The returning troops entered their home base of RAF Honington in Suffolk by formally marching into the hangar where friends and family were waiting. While the event was one of great happiness and celebration, the tragic loss of one of their comrades, Senior Aircraftman Ryan Tomlin, during the deployment was keenly felt. I am incredibly impressed by the squadron’s achievements during their challenging tour and we are all very proud of them. Their contribution to the ongoing operations in Afghanistan remains vital to the overall mission. I am elated, excited, overwhelmed and emotional! I am nervous, very excited and looking forward to a nice holiday! This was the unit’s third tour of Afghanistan, with their last tour ending in July 2010. The RAF Regiment is celebrating its 70th anniversary this year. It formed during the Second World War when the acute need for a dedicated and specialist force to protect critical airfields and air operations was realised. Operations in Afghanistan and across the world have demonstrated that the RAF Regiment is a world leader in air-minded force protection and many foreign Air Forces are turning to the RAF Regiment for advice and guidance. 2 Squadron’s homecoming parade will take place through Bury St Edmunds on 30 June.